Alfred "Krip" Yuson has been on the Filipino literary scene a long time. Author of 12 books of poetry,fiction, essays and children's stories, he has received national and international literary awards, fellowships, and prizes. Yuson has attended conferences, festivals and retreats in the United States, England, Scotland, Japan, China, Finland, Thailand, Malaysia, Australia, Singapore and Hong Kong. He is a founding member of the Philippine Literary Arts Council (PLAC) and the Manila Critics Circle. He writes a weekly literature column for The PhilippineStar and teaches writing at the Ateneo. Based on his extensive writing and teaching experiences, and his direct participation in and encouragement of Filipino literature, Krip has gathered a collection of essays which was launched this past October, at National Bookstore Shangri-la EDSA, in Mandaluyong City. Guests of honor were National Artist for Literarure F. Sionil Jose, MTRCB Chair Alejandro Roces, and Ateneo University Communications Department Chair Doreen Fernandez, who delivered brief remarks during the program. Jimmy Abad, professor at the University of the Philippines, also gave a short welcome to the book on behalf of UP Creative Writing Center director, Cristina P. Hidalgo, who was unable to make the occasion. The Word on Paradise contains 75 piecesthe Palanca Hall-of-Famer's book reviews, columns and feature articles on contemporary Filipino literature during the past decade, as well as lectures and critical essays. The book also features a Photo Gallery of distinguished literary figures. 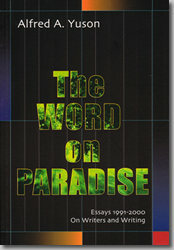 The Word on Paradise will provide a treasure chest of documentation and detailed commentary on the events in contemporary Filipino literature.